Claudia González-Rubio was born in Mexico City. She studied English Literature at the National Autonomous University of Mexico (UNAM) and holds a B.A. in Spanish and English Literature from the University of Seville, Spain. In 2010 she received a scholarship to study a PhD in Theater Studies at Cornell University, in New York. 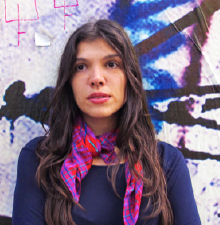 In 2011 she won the Matilde Landeta Screenwriting Contest for her feature script Caravana, and in 2012 she received a development grant by the Mexican Film Institute (IMCINE) for that same script. Claudia recently completed her first short film, No Swimming in the Pond, shot in San Francisco, California, and she currently works as a screenwriter for Mexican television shows and series. Caravana — In the midst of desolation and hopelessness, Celeste and Antonio found their liberation.